Chris Mayne notched an important milestone when he kicked the first of his two goals against Brisbane on Saturday night. 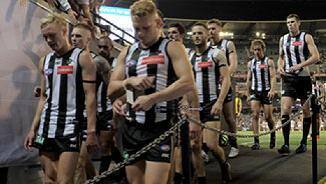 Catch up on Collingwood's season-opening clash with the Western Bulldogs with AFL Media's five biggest talking points from the Magpies' 14-point loss. Chris Mayne brought nearly a decade of AFL experience to Collingwood in 2017. Prior to his first year in Black and White, Mayne was a regular in Fremantle’s first-choice line up and played a key role in the club’s charge to its first ever Grand Final in 2013. It was in that year that he ranked second for goals, second for marks and fourth for tackles, including 13 in the Preliminary Final. At 188cm he is a good size for a hybrid role in attack, be it marking overhead or working hard to trap the ball at ground level. After playing regularly during his time at Fremantle, Mayne had a difficult time breaking into Collingwood’s starting 22 in 2017. 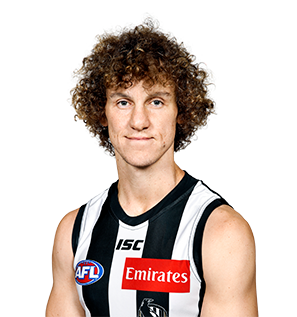 Originally left out of the Magpies’ round one side, the West Australian was a late inclusion for James Aish and finished with 13 disposals and a goal in a 14-point loss to the Western Bulldogs. He remained in the side for another two weeks and celebrated his first win in Collingwood colours on the road in round three. Unfortunately, Mayne’s season would continue in the VFL. He played 18 games under new coach Jared Rivers and found form mid-season with nine goals in two games against Casey and Port Melbourne respectively. While he couldn’t find a re-call to the AFL team, Mayne’s work rate and attitude received praise from captain Scott Pendlebury after the season concluded. 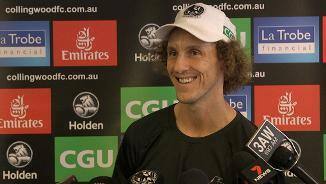 “As a teammate and as his captain, you can’t fault the bloke for his application around the football club and his investment around the guys,” Pendlebury said in September. In a year of change at Dockerland, Mayne remained a constant. He didn’t miss a game for the first time since 2011, kicking 18 goals, including a haul of four against Brisbane in round 12. He began to play behind the ball in the latter stages of the year, registering four rebounds and 20 disposals against Adelaide in round 20. At season’s end, the Perth native made his way to Collingwood on a four-year deal via free agency. His tackle pressure remains elite, averaging five per game in 2016. After kicking just 13 goals in 2014, he bounced back with 28 in 2015 to finish third on the club’s goalkicking list. Mayne had a consistent season up forward, kicking two bags of four and kicking goals in each of his last nine games. He led the club for tackles (122) and was third in goal assists. He finished ninth in the best and fairest. The versatile forward had a difficult 2014 season following his stunning 2013 form. He was hindered during the pre-season by a back injury, which hampered his preparation. He kicked just 13 goals after two seasons when he kicked 37 and 39 respectively. He was swung into defence on a couple of occasions to cover for injuries and did an admirable job. He still played 23 games and finished fifth at the club for tackles (91). The versatile forward had another exceptional season, playing all but one game and kicking 37 goals. His accuracy in front of goal continues to be among the elite in the AFL, while tackling pressure remained a strong feature of his game. He takes a good overhead mark for his size and has plenty of courage. Mayne achieved his 100-game milestone against Greater Western Sydney in round 20. The versatile forward took his game to a new level, playing all but one game and kicking 39 goals to finish runner-up in the best and fairest. A revamped set-shot routine saw him kick just seven behinds for the season, while tackling pressure remained a strong feature of his game. He takes a good overhead mark for his size and has plenty of courage. After an injury plagued start to his career, the forward played every game in 2011, spending time in the midfield and kicking an equal club-high 25 goals. Forward pressure is a strong feature of his game and he also led Fremantle for tackles (92). Takes a good overhead mark and has plenty of courage, but is more suited to playing as a third forward target. Injury-plagued forward who has developed into an important part of Fremantle’s forward line. A troublesome ankle restricted his output in the second half of 2010, but he returned to play in the Dockers’ two final. Kicks goals and puts intense pressure on the opposition backmen. Takes a good overhead mark and has plenty of courage. Contracted until the end of this season and will join the leadership group in 2011. Restricted to five games in 2009 after having an interrupted pre-season with stress fractures in his shins. Kicked 10 goals on returning to the side and applied pressure to the opposition defenders. Had an excellent debut season in 2008, when he played 17 games. Played senior football with Perth before joining the Dockers. Takes a good overhead mark and has plenty of courage. Had a tremendous debut season, playing 17 games. Racked up 223 possessions and was among Fremantle’s best in several games. Had already played senior football with Perth before joining the club and looks comfortable at AFL level. Takes a good overhead mark and has plenty of courage. Already has played senior football with Perth and looks an outstanding forward prospect as he takes an exceptional mark and leads well. Had injury problems in 2006, but blossomed last season.